Traditions are staples for a family. They hold you together in the tough times, give fond memories as we grow older, and give stability. I think one of the ways to build a strong family is to have a tradition filled home. Christmas is a time to build many traditions. We spend Christmas with my in-laws, so we choose a day (with a free evening the night before) to have our own Christmas. So when I refer to Christmas Eve and Christmas, it is referring to whatever day we have chosen to celebrate. Here are a few of the traditions we have at Christmas. The night before - our 'Christmas Eve' - we go for a drive and look at Christmas lights. We always stop and get Hot Chocolate ... sometimes from McDonald's ... sometimes from Starbucks, depending on our financial ability. (This year will be starbucks because they have White Hot Chocolate - yummy!!!). In the past I have made sippy cups of warm chocolate milk for the younger set - may still do that for the girls this year. We then come home and watch "The Nativity Story". I love this movie!! 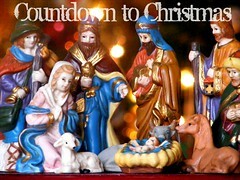 I like that it starts our Christmas focusing on our savior - and the real meaning of Christmas. On Christmas morning we wake up and have breakfast - it's always egg casserole, sticky buns, and fluffy hot chocolate. We open gifts. We open one at a time. Once you open your gift you choose the next gift to be opened, and so on. For lunch we always have Cornish Game hens and twice baked potatoes. We have a picnic dinner of cheese, crackers, cheese ball and beef log on the floor while we watch a movie together. Every year we do these same things. The kids know exactly what to expect and look forward to each and every aspect. Are you building traditions in your family? How do you make your holiday special and memorable? I encourage you to make lasting memories for your family and create some traditions of your own! I LOVE having a traditional routine...like you said the kids know what they can expect and look forward to! Such a fun magical time of year...and we even have beautiful white snow covering the ground that the kids just can't seem to get enough of!